If you have ever flown over a coastal area and observed a river meeting the ocean, chances are you have had the opportunity to see a river plume. The patch of distinctly colored water demonstrates the clear continuity of the river flow as it enters the ocean. From this visual, it becomes obvious that rivers dominate the transfer of suspended material from freshwater sources, acting as a primary connector between continents, river-estuary systems, and the ocean. Rivers also carry the signature of our land-based impacts, such as dam construction, land and fertilizer use, increased sewage loading, and mangrove destruction. The biogeochemical impact of river plumes and their role in supplying nutrients to tropical oceans remains poorly understood. The ocean is not an infinite sink for such impacts and more knowledge about how these materials affect the ocean chemically and biologically is needed, as this information can be applied towards coastal management plans and mitigation. The Mekong River is one of the world’s great river systems. It flows along 4,909 km and through six countries including China, Myanmar, Thailand, Laos, Cambodia, and Vietnam. It is the twelfth longest river in the world and the seventh longest in Asia. It is also is one of the most biologically diverse rivers in the world—second only to the Amazon. The Mekong River’s biodiversity is fundamental to the natural resource-based rural livelihoods of a large population. At the end of the Mekong, the river flows through an extensive delta and meets the South China Sea. The South China Sea is adjacent to a region in Vietnam of rapid land use change, strongly influenced by riverine inputs, including a seasonal offshore jet that transports the Mekong River plume well offshore. The drainage basin into which the river flows is rather small when compared to its discharge volume. 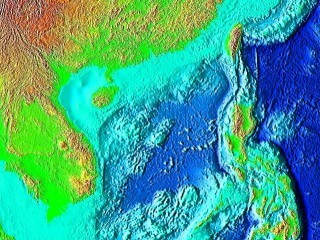 The riverine fluxes of water, sediments, and nutrients likely are affecting the natural balance of the South China Sea. This area provides an excellent site for exploring and characterizing the role of riverine inputs with human-induced modifications, as well as the role of ocean circulation in controlling productivity in a tropical coastal marine ecosystem. A variety of biological processes are affected by the circulation of the South China Sea, especially during upwelling, which has a strong effect on the spatial distribution of phytoplankton biomass and activity. The South China Sea basin has received relatively little attention to date. 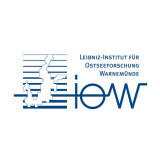 However, its study can provide important insights into the relationship between land and sea through the discharge of river contents into ocean waters. To capture seasonal differences in the Mekong River output, research vessel Falkor traveled to the South China Sea during the spring of 2016. 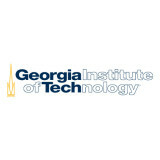 Led by Dr. Montoya from the Georgia Institute of Technology, and his experienced science team, the group purposely worked during monsoon season. A bumpy ride was to be expected, but there was good justification for such a decision. The monsoon brings intense rainfall to Indochina, producing large pulses of riverine flow into the South China Sea via the Mekong River. It is a critical period when both upwelling and riverine flow are strong in the area of study, so characterizing the biochemical environment during this season is key. The strong winds that come with the monsoon are a fundamental factor when it comes to ocean upwelling. Cold water rises from the depths of the ocean to the surface, providing nutrients which stimulate the growth and reproduction of primary producers (phytoplankton) and other links in the food web, such as zooplankton. 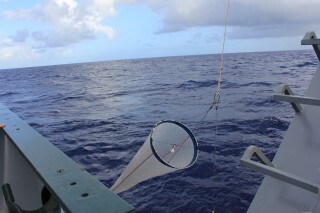 Monsoon season was the prime time for the scientists to collect these water and plankton samples. 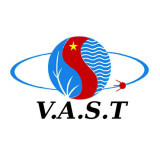 The highly interdisciplinary science team used numerical modeling and approaches from biological oceanography and marine biogeochemistry to quantify the biogeochemical response of the South China Sea to riverine inputs of nutrients, and contrasted it with the impact of upwelled nutrients. Nutrients might sound like a good thing, but they can actually become a form of water pollution. When a marine environment becomes enriched with nutrients, eutrophication occurs. Coastal ocean waters usually have significant inputs of nutrients from land, but if the ecosystem is overloaded with nutrients, many biological effects can be observed. 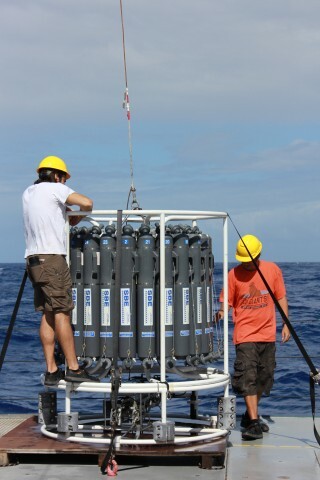 The scientists onboard Falkor conducted an investigation of the key physical and biogeochemical processes that control eutrophication and ultimately may lead to ecosystem changes in the coastal waters of the South China Sea. This field research focused on characterizing nutrient loads carried by the Mekong River, using a suite of basic physical, chemical, and biological measurements. Surface water samples were collected by the team, along with plankton samples from the water column. Some of the plankton were be incubated to measure their activity, and enrichment studies were carried out to assess the role of nutrients in limiting production, promoting nitrogen fixation, and controlling phytoplankton diversity and activity. When the Mekong River enters the ocean, it does so carrying high runoff with the clear signature of anthropogenic activity. The scientists believe that the South China Sea basin could become an excellent model system for studying terrestrial-oceanic linkages, nutrient dynamics, and the potential impact of land use change on marine ecosystems, but they need to move fast. The Mekong basin is undergoing rapid and accelerating changes in land use, which in turn is modifying the fluxes of water and nutrients downriver. Scientists believe that these changes should be detectable in the biological response of the marine ecosystem on short time scales. This expedition onboard of Falkor was be one of the few opportunities to study the South China Sea before significant modifications in nutrient and organic matter loading occur as a result of changes in the river basin. The field data acquired provide a critical overview of the state of the South China Sea early in this transition and help us better understand how the activities we carry out deep inland find their way to the ocean. The resulting shipboard dataset is being stored at the Rolling Deck to Repository and is now available. There is no cruise related news at this time.